The teachers at Daniel R. Aguinaldo National High School (DRANHS) are planning to exhibit the armchair used by presidential frontrunner Rodrigo Duterte during the May 9 general elections in a museum in Davao City. According to a report from GMA News' 24 Oras, the chair, now being called as the “Seat of Victory,” has received admiration from the supporters of the maverick mayor. School authorities have already placed the chair inside the principal’s office to protect it from the dozens of people who want to see it. As part of its commemoration, the teachers plan to preserve it in a glass case before putting in a museum. The description on the display will read, ”The historical chair used by Mayor Rody Duterte while casting vote in the May 9, 2016 national election." Sun Star Davao reported that the chair will likely be transferred to the Museo Dabawenyo in Poblacion District. "Meron na po kaming plan na ilagay siya sa glass," said Rosalinda Sondong, a teacher from the school. "Nasukatan na po and soon mai-deliver na ito kasi we know for a fact that people will be coming here every now and then to see it." 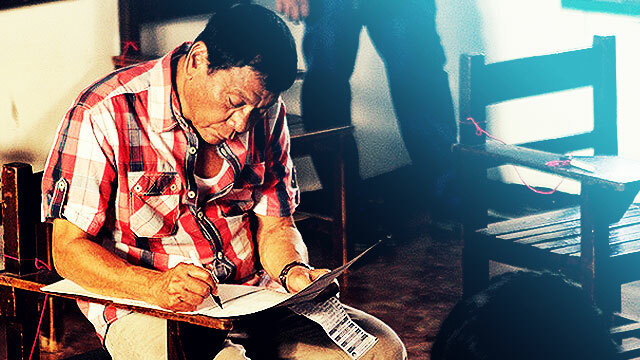 With 15,968,245 votes as of 8:45 p.m. Monday (May 16), Duterte is considered as the clear-cut winner of the race for the presidency.